This entry was posted in World, near and far and tagged #atozchallenge2018, Fictional character traits, zingy. Bookmark the permalink. Yay to us. Great work, Susan. I’ve learned so much from your posts, Silvia and thoroughly enjoyed each one. It’s funny that you say that you don’t know how zingy characters do it. It has always seemed to me that you are one of those zingy characters, capable of raising your family, writing books, and leaping tall buildings. It has been wonderful to meet you. You can certainly count on me continuing to read and comment on your blog. The feeling is mutual, Karen. Meeting you and others like you made the challenge so enjoyable. You definitely exhibit Zing! Your posts have been excellent, educational, enjoyable, and fun. Great job! Now, you can go collapse and take a LONG nap, as you deserve to be Zapped! Congratulations on finishing the 2018 A to Z Challenge. You deserve a Gold Star!! Thanks so much for being here, Gwynn. That was a good example, Silvia – I remember reading this book before the movie was released (book is usually better than movie!). Congratulations on finishing your A to Z posts! I know you put a lot of work into each one, and I’ve enjoyed reading them very much. You too, Martha. Now, a little time off. We deserve it. 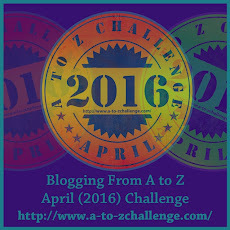 Congratulations on such a good job with the A to Z challenge! Well, I am certainly zapped right now! But it was fun and now over! Back to some normalcy. I read I Don’t Know How She Does It a while back. Written by a Brit from London, I believe. Such an entertaining book. I had no desire to see the movie . . . Cheers to another completed AtoZ, Silvia! That is a title that will resonate with so many of us working moms. A job you struggled to get balanced against kids. Somehow, it works out though, doesn’t it? Hi Silvia, character traits were an inspired choice for A-Z. I’ll have to go back and read your earlier posts. Late to the party but am visiting the other 13 bloggers noted as “no longer strangers” at Karen’s Profound Journey blog. Second off… what an interesting theme you put together! I look forward to reading through each of the 26 letters to see the collection of characteristics you’ve assembled. What a great idea to include book and movie examples. I have to say, the xenoform is inspired. I would have had no idea what to write there, and it’s a great one! Great work with the challenge! Thanks for visiting my site and leaving a comment, and for being so awesome that Karen featured you at Profound Journey! She really is building quite the tribe. I think zing is the perfect word for when you feel your energy zapped but still an exhilarating burst of accomplishment. Zing!